If you are a gluten-free eater or not, Van's is a great brand for all families this summer for healthy eating and snacking! Van’s, a leader in wholesome snacks that satisfy the kid in everyone, recently introduced new snack bars and granolas. I have tried them and you will want to try them too! Van’s Double Chocolate and Banana Nut Granola are made with 12-14 grams of gluten-free, whole grains per serving – all with no artificial colors, flavors or preservatives. These are great in yogurt, with milk or just as a quick snack throughout the day! Van’s Chocolate Gramwich Sandwich Bars are made with real chocolate sandwiched between two whole-grain, graham-style bars for a one-of-a-kind pick-me-up. If you like smores, these are a good version of them without the marshmallow! Van’s Banana Bread Bars blend banana flavor with gluten-free oats and flaxseed for a portable version of banana bread. I am not really even a fan of banana bread usually but I am so glad I gave these bars a chance because they were REALLY GOOD! They were soft and chewy and were a great snack throughout the day! And they have many other great products that we have been enjoying as well including their organic waffles, crackers and cereals! Van's is definitely a great brand to stock up on this summer for healthy & gluten-free eating! You can purchase Van's products at your local retailer. 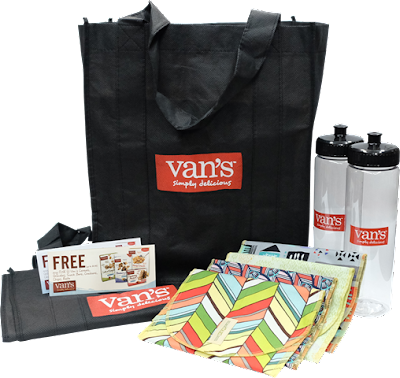 Van's is generously offering (1) Van's Prize Pack to a lucky winner! Thank you The Review Stew and Van's! We look forward to trying Van's Snacks.